just went outside for a smoke at 2 am. I looked at the moon and I could see several objects darting about near the moons horizon. I took a picture with my camera through my binocular lens. Although many of the items had moved position,one is clearly caught in the photo that appears to be glowing green. I was taking pictures of the moon with my Nikon p900 close zoom and all were nice pictures but one caught what looks like a large ship in front of the moon. I did not see it until I revised them. I was take pictures with my Nikon p900 of the moon. The camera has a extreme zoom. It was an awesome full moon. 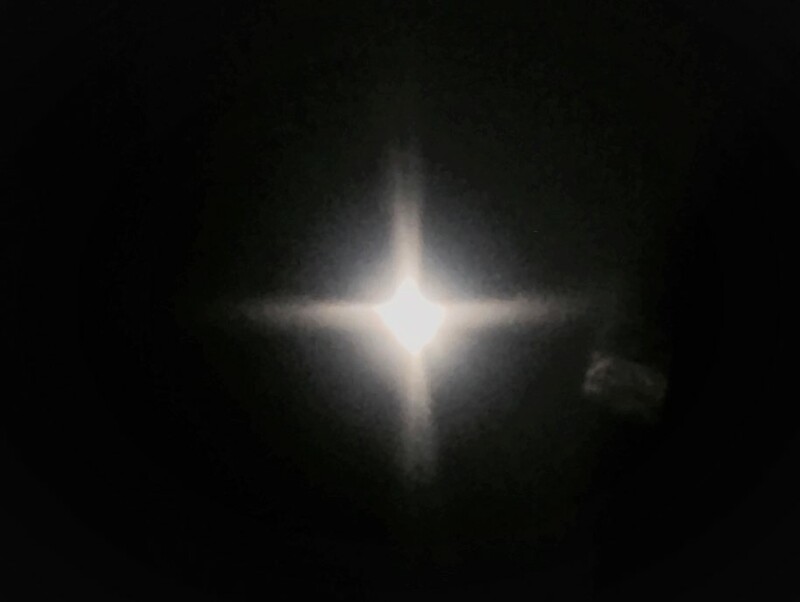 I took many pictures - one took a pic of what looks like a large craft in front of the moon. The rest do not have the object. What do you think of this amazing shot of a UFO by the moon? Is there an easier explanation than aliens? Perhaps there was something on the lens or this photo just shows a bug or even an explainable commercial craft. Share your thoughts in the comments below or on Facebook, Twitter or Instagram! In the meantime, check TexasUFOs.com every day for the latest UFO sightings and news, and also for the latest episodes of The Weird UFO Show! This is pretty simple. I was taking shots of the eclipse with an Iphone 7 and not having much luck. I took multiple shots on different settings. At one point I took a photo and noticed a contrail running across the eclipse that appeared to be just be from an airplane. I decided to turn down the "exposure" setting (I think thats what it is) and took a photo with the screen being mostly black except the sun itself. I immediately noticed a very clear rectangular object. I looked up with my own eyes and couldnt see anything in the glare of the sun but the object was clearly there. I was in an open area with nothing above me. Theres obviously something there but I couldnt tell you what it was. What do you think of the latest UFO sightings report from last month's eclipse? Is this a real UFO, or is there an easy explanation? Share your thoughts in the comments below, or on Facebook, Twitter, or Instagram! Did you photograph or capture on video a UFO during the eclipse? Report it! While you're here, browse other recent UFO sightings during the 2017 eclipse! What do you think these strange lights could be? Lens flare? Meteors? Other moon rovers? Share your opinions in the comments below, or join the conversation on Facebook, Twitter or Instagram!